Able Muse Press, 9781927409756, 124pp. Poetry. 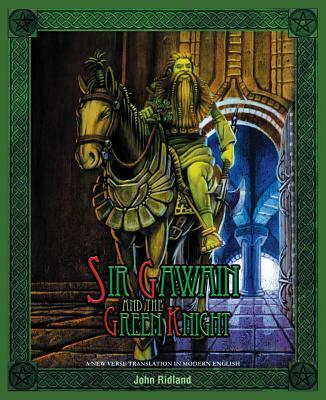 SIR GAWAIN AND THE GREEN KNIGHT by the anonymous Gawain-Poet (or Pearl-Poet) is, like Beowulf, one of the greatest classics of English literature. Hailed as the finest Arthurian romance, this technically brilliant tale of enchantment, faith, temptation, and chivalry is tautly constructed, with a wonderfully rich vocabulary and vivid language that blends sophisticated atmosphere with psychological depth. John Ridland's new Modern English translation, unlike most presentations, is complete, covering every passage and word of the Middle English, Northwest Midland dialect original with the same line numbering, contents and meaning. His is the only version written in a familiar modern meter pleasurable to modern ears, yet retaining the spirit of repetition and alliteration of the medieval original. And Dr. Ridland's introduction and notes are enlightening. This translation is a must-have for unlocking all the pleasures and delights of the original classic. "The language in which the consummate poet and translator John Ridland serves up this delicious story in verse is exactly what it deserves. The descriptions are exuberant, the narrative flows and exhilarates like the wine at the courts we're asked to imagine, and the exchanges between complex characters so subtly flavored by intelligent diplomacy that it makes the dialogue of much current fiction seem, by contrast, like a six-pack on the front stoop. Read this book. I suspect that, like all enchantments, it shifts and assumes different forms to different eyes. But I do guarantee surprises, and inexhaustible delight." Rhina P. Espaillat.